First, you need to have a Premium account, as this feature is currently only available to Premium customers. On the side of the screen click on New Recurring Job. In the next screen, you need to tell WorkflowMax how often you would like the new job to repeat, for example 1 Month would be every month, 3 Month(s) would make the job appear quarterly. 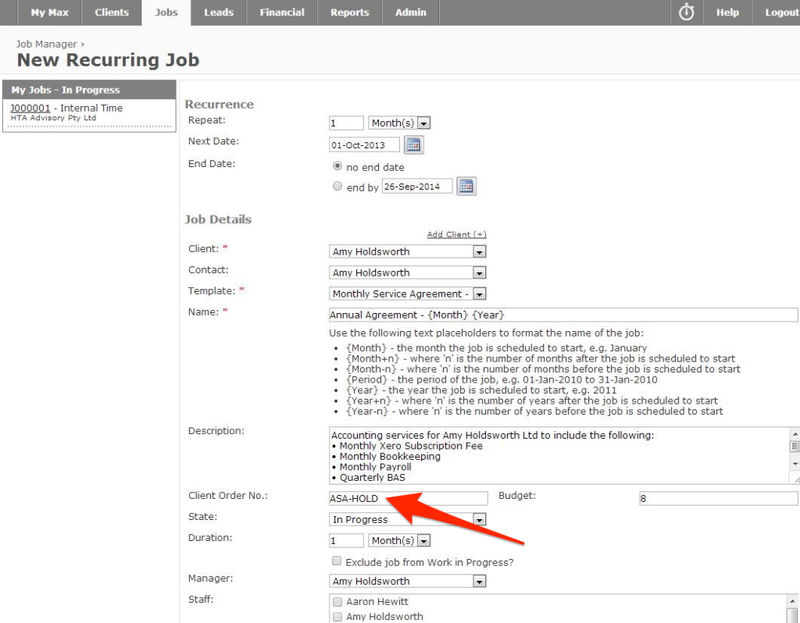 Select the Client, and then the specific Job Template you would like the job to be set up with. It will populate the Name and Description automatically. If you would like to alter this, you can do so. The CLIENT ORDER NO is IMPORTANT whatever you place in this space, you must copy this and use in the reference section of the recurring invoice that you will set up in Xero. The Budget in $ or Hours can be filled in along with the State of the job for when it is created. For example if the client has agreed to the work, you may select the job be appear with the state of In progress already. Duration will be for how long you want the job open. If it is a Monthly job, have the job open for 1 Month. Select the staff that will always be working on this job. Once completed, select save and your job will automatically create on the 1st of every month moving forward. 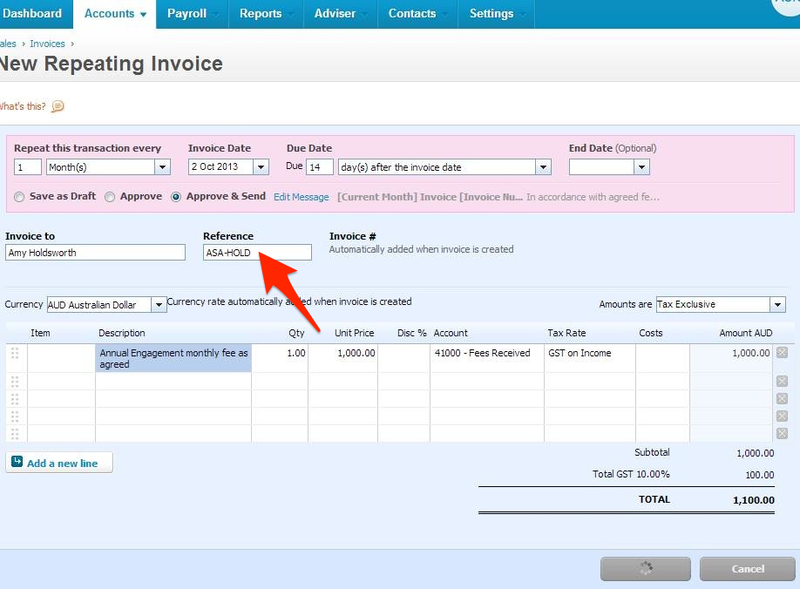 On the next screen, tell the Invoice to create the exact same way that you told WorkflowMax to create the job for example, repeating every week/month. The INVOICE DATE, MUST BE THE DAY AFTER THE JOB IS CREATED. For ease, tell WorkflowMax to create the job on the 1st of the Month and tell Xero to create the invoice on the 2nd of every month. In order to match up the Invoice to the specific Job, the job needs to be there first. Due date is in regards to your payment terms, eg, 14 days and again, end date is if there is a fixed term contract in place. Fill in the remainder of the information as per your invoice details. Ensure you have the Approve & Send button highlighted for the email to be automatically sent and then click save. On the 1st of every month, a new Job in WorkflowMax will appear, on the 2nd of every month the Client will receive an invoice that has been emailed to them and your WorkflowMax job will have an invoice attached to it! If you have your client on a Direct Debit, change the wording of the invoice email they receive. Got any questions, please let us know in the comments below! 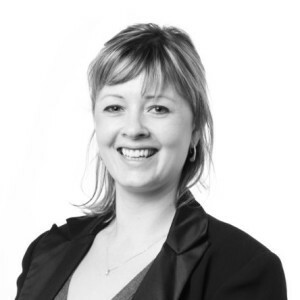 Amy Holdsworth is the Business & Information Systems Manager at HTA Advisory — a leading accounting and business advisory firm based in Melbourne, Australia. Amy specialises in cloud based products, taking a holistic view and spending time to discover and understand your needs to improve your business and take it in the direction you want.